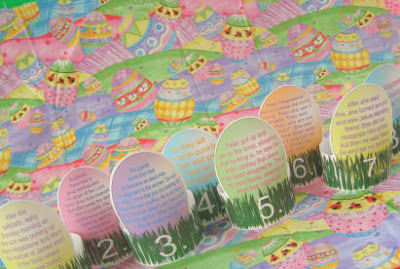 Each of these eggs has a piece of the resurrection story, and they’re numbered. Basically, what you do is incorporate them into your table setting. 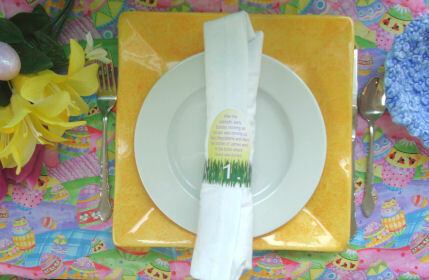 After blessing your food around your Easter table, the resurrection story is read by everyone around the table! Just print them, cut them out, and tape them into a ring. 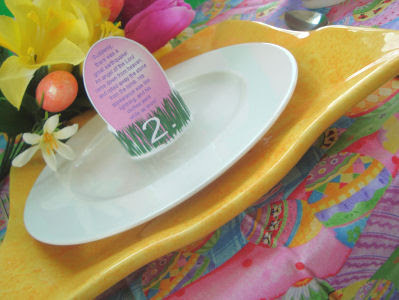 …or they can stand up on their own right on your Easter place settings! 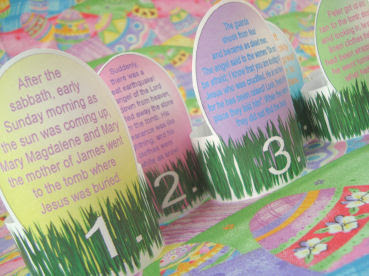 If you’d like to make your own so you can have the right number for your guests, here’s my printable resurrection story you can use as a jumping off place. I’m squealing over here in excitement to use these, thank you SO much for sharing this idea! I love Catholic Icing! Thanks for your creative ideas of sharing the joy of Resurrection with my family and my Catholic preschoolers! Can’t thank you enough for making all these wonderful resources for us to use!!!!! My kids love them!! I’m trying to figure out how to make Easter more special & memorable. I love these! I’m printing some for my family and sharing this one on my blog!